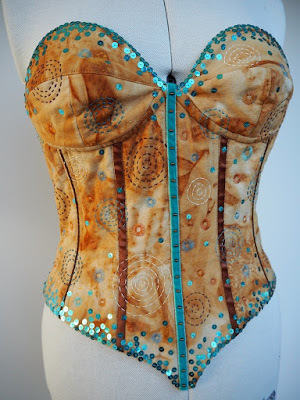 It's been a long time since I made clothes and even when I did they were quite basic, but recently Art a'Peel (the local textile group I'm a member of) challenged the members to create an artistic corset. It was interesting to see each members approach to the theme - some did two dimensional designs which were framed, or on canvas, and others created actual corsets in varying sizes. It's always inspiring to see how each person interprets a challenge. 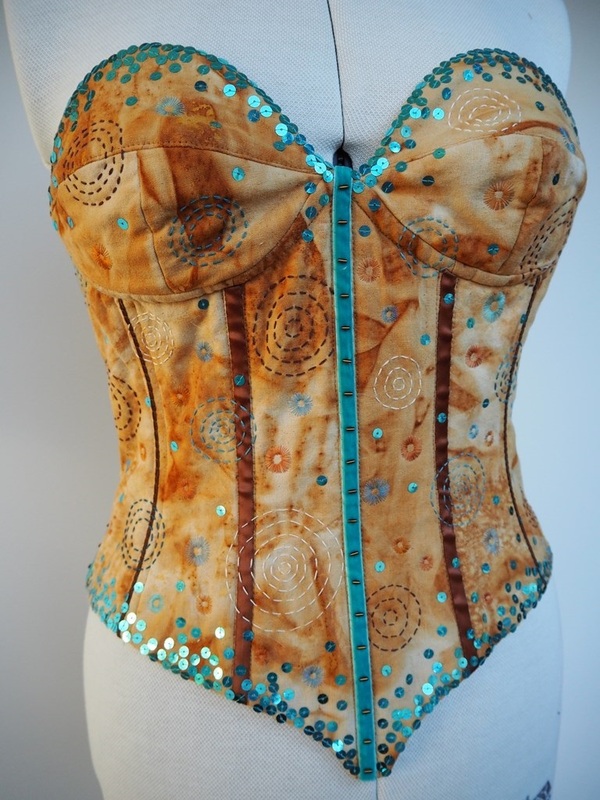 For me I threw myself wholeheartedly into creating a full size corset with no idea at all what I was doing, as lining and boning were new techniques. However, I have to admit once it was done I was quite thrilled with the end result. It's good to push your boundaries and try something new - we never know what we're capable of until we try. I started off with some Osnaburg fabric I'd previously rust dyed, as it had good strength but was soft and manageable, and lined it with Quilters Muslin. 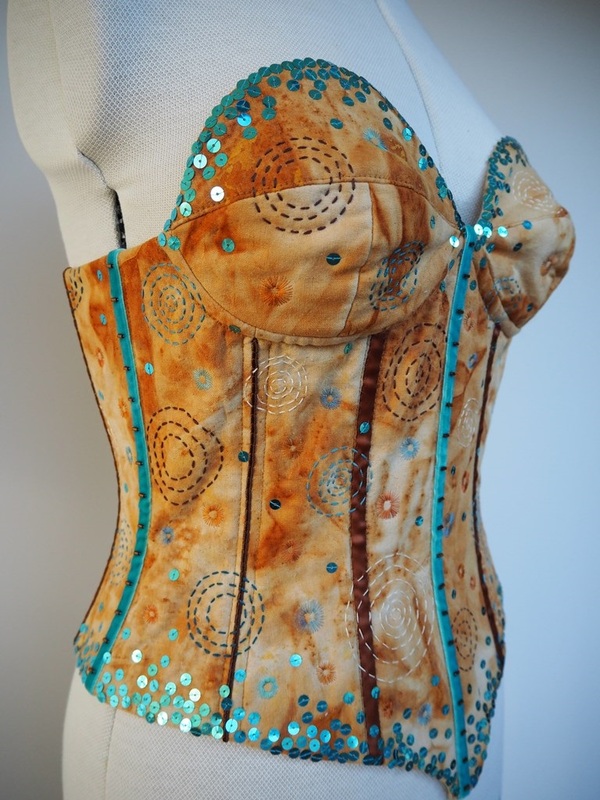 The embroidery was hand stitched and on an evening sitting attaching the many sequins was quite relaxing. 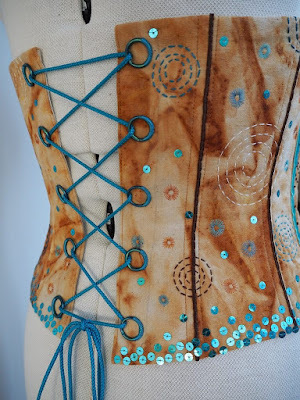 The rings for the lacing are metal curtain rings, heated with a heat gun and dipped in embossing powder to coat them with a colour to match the sequins and embroidery. It was fiddly but worked well and tied it all together (pardon the pun!). My grandson asked me if it was for me, or a young person - I've learnt to smile sweetly and not take offence.